Appearances can be deceptive. This adage held perfectly true at the Eden Gardens on Day Three of the second Test as the two West Indies innings were complete antithesis of each other. While the morning looked like a horror movie from their point of view, the second was more akin to a valiant battle against overwhelming odds. Golf is often described as a tussle between a player and the course and that was proven yet again on the third and final day of the eighth-leg of the Hero Professional Women’s Tour. The degree of difficulty at the Panchkula Golf Course was compounded by the strong winds whipping across the course and the fast, unpredictable nature of the greeens. The doping controversy surrounding the ongoing Kabaddi World Cup refuses to die down. After Australia it was the turn of USA to face the disqualification from the ongoing World Cup as four of its players were tested positive and four players refused to give dope test. Former ICC Anti-Corruption Unit chief Paul Condon has made a sensational claim that every international team was involved in match-fixing at some stage in the 1990s. Condon, who was founding head of the ICC's ACSU, said match fixing was not just restricted to Indian sub-continent. India is waking up to more sports and there is a definite influx of money and will. Following the recent successes of Indian boxers on the world stage, it comes as no surprise that the World Series Boxing (WSB) is all set to enthral enthusiasts with the best in the business fighting for 12 different franchises in a league format. Portugal scored six goals against Bosnia including a Cristiano Ronaldo double to grab a ticket to the Euro 2012 finals while Ireland, Czech Republic and Croatia completed the lineup without the need for a frenzied finale to their playoff wins on Tuesday. Portugal's second leg was the only tie still finely balanced following a goalless draw in the first match and, after letting Bosnia back into the game twice, they finally ran out 6-2 winners after the visitors were reduced to 10 men. Saina Nehwal started her title defence with a thrashing straight-game victory over local girl Tsz Ka Chan to advance to the second round of the Hong Kong Super Series today. World number four Saina too just 28 minutes to send Chan packing 21-4, 21-17 in the women's singles competition at the Hong Kong Coliseum here. Appearances can be deceptive. This adage held perfectly true at the Eden Gardens on Day Three of the second Test as the two West Indies innings were complete antithesis of each other. While the morning looked like a horror movie from their point of view, the second was more akin to a valiant battle against overwhelming odds. The deception lay in the fact that while they managed to make the pitch look like a minefield in the morning, the true colours of the track were reflected against the setting sun. At stumps on Day Three, the West Indies, after being dismissed for a meagre 153 in their first innings at the stroke of lunch, were 195 for three in their second essay after following on. While this display was way better, given the 478-run lead they conceded in the first innings, they have been effectively reduced to making a fight of it, since defeat still stares them in the face. 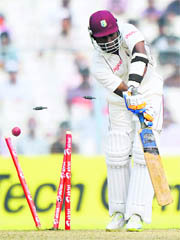 Darren Bravo was batting on an aggressive 38, with Shivnarine Chanderpaul at 21. They are still 283 runs behind India’s first-innings effort, with seven wickets in hand. The morning began as everyone here was expecting and in fact till the second innings began, there were conjectures, with justification, that the match may end on the third day itself. From their overnight 34 for two, the visitors were reduced to 46 for four with two leg-befores, removing overnight batsman Kirk Edwards and the normally dependable Shivnarine Chanderpaul, with Pragyan Ojha and Ravichandran Ashwin making the breakthroughs. Umesh Yadav however was the revelation of the morning, as he bowled with fire and wisdom, pitching it up and letting the ball do the rest. A tentative approach from the West Indians helped and their half-forward play cost them the wickets of Darren Bravo and Marlon Samuels, after they had put up 46 runs, the best partnership of the innings. Ojha kept it tight and the batsmen obliged with poor application as he claimed two more leg-befores and the innings folded to an inglorious end. The second innings has so far been a different story. Adrian Barath and Kirk Edwards put their heads down and negotiated the demons - more imagined than real - with the basics in place and pitch suddenly became docile. After losing Kraigg Brathwaite to the impressive Yadav, the duo were engaged in a 93-run second-wicket stand, which gradually spread the field and left the Indians waiting for mistakes. It wasn’t like the bowlers weren’t effective. It’s just that they were negotiated that much more effectively this time, with the batsmen realising the merits of application. Edwards is more pleasing to the eye than Barath but the latter is more aggressive. So even as they kept their heads down most of the time, runs kept coming at a decent clip. Mahendra Singh Dhoni soon realised that this West Indies effort did not have a self-destruct button and the field slowly began to spread. But given the huge target the visitors have to negotiate, surely there was a case for keeping the close-in fielders around. Ishant Sharma’s effective spell however took care of both Barath and Edwards and the West Indies were once more reminded of their precarious position. But Bravo and Chanderpaul lived on, to fight another day. Bowling: Ojha 22-5-64-4, Yadav 7-1-23-3, Ashwin 14-3-49-2, Ishant 5-2-14-0. Bowling: Yadav 10-1-36-1, Ishant 14-3-41-2, Ojha 11-3-37-0, Ashwin 20-1-51-0, Yuvraj 3-0-14-0, Sehwag 4-0-12-0. When you throw into this mix a gruelling and intriguing battle between leader Nalini Singh Siwach from Delhi and second-placed Bangalore’s Sharmila Nicollet, the plot thickens quite a bit. By the end of the day, it was Nalini who not only overcame the demons in the course but also a spirited challenge from Sharmila, to win the title with a superb effort of three-under 70. Nalini’s total score after 54 holes was two-under 217 and that gave her a winner’s prize of Rs 75,000. Nalini was the winner today over Sharmila by a comfortable margin of four shots. Sharmila was also very impressive in the final round today shooting a score of two-under 71 for an overall aggregate of two-under 221 to pocket the runners-up cheque of Rs 45,000. In today’s play, it was only on the par-five 15th hole that Nalini made a bogey due to a penalty after her tee-shot went out of bounds. It is undoubtedly a difficult hole, where a tree stands in the middle of the fairway just short of the green, a bunker beckons just to the left of it and the left side is out of bounds. Even Sharmila had to play her third shot at this hole from the bunker, yet she managed to save her par with an impressive chip. While the par-four 16th hole seemed to be an easy one, Sharmila’s course management skills were viciously tested here after her tee-shot went into the rough and into the tress. But her delectable chip shot sailed over the bunkers and landed softly on the green. But Sharmila misssed an easy par putt here and dropped a shot while Nalini was able to save her par on this one. As both players began running out of holes it was becoming increasingly apparent that Sharmila will be unable to catch Nalini and both players joked and laughed together as they moved towards the last hole. They seemed to having a lot of fun together. By the time the players reached the last hole the breeze had dropped to a gentle canter. The droplets of water from the fountain next to the fairway bunker were glistening and making a rainbow pattern through which both Nalini and Sharmila could be seen chipping onto the green. With a total 34 players being found positive so far and Pakistan unwilling to undergo a doping test, a visibly upset Sikander Singh Maluka, president of the Punjab Kabaddi Association and organiser of the Kabaddi World Cup said the scheduled march past of the participating countries during the final had been canceled. “We are shocked the way things have progressed. We had never imagined that so many players would test positive. We had told all the participating nations to get the dope test conducted in their respective countries but they did not listen to us and now the players are being found positive,” said Maluka. He said players from Australia and USA would not get a single penny after being disqualified. The Canadian Sports Minister is all set to visit the final in Ludhiana. "In the late 1990s, Test and World Cup matches were being routinely fixed. From the late Eighties certainly through to 1999-2000 there were a number of teams involved in fixing, and certainly more than the Indian sub-continent teams were involved," the 64-year-old Condon told Evening Standard. "Every international team, at some stage, had someone doing some funny stuff." Condon said the players of that era perhaps had full knowledge of what's happening around but chose to keep mum. "A whole generation of cricketers playing in the late 1990s must've known what was going on and did nothing. When they look back on their careers, a bit of shame must creep in. The last fixes of whole matches, or even series, were probably in 2001 before we'd really got the unit going." Condon also claimed that it all began in United Kingdom with County teams fixing friendly leagues but not for money. "It started with friendly fixes in the UK in the old Sunday leagues. Over a weekend you'd have a county side playing their county match and then a Sunday league match and there would be friendly fixes, not for money but for manipulating places in the leagues. Indian boxer Akhil Kumar is part of the Mumbai Fighters in World Series Boxing. 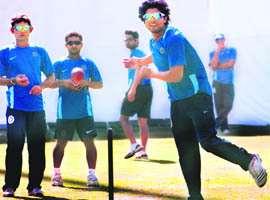 The Indian franchise, Mumbai Fighters, is gearing up for its first home game on December 9. The signing of Olympian and former Commonwealth Games gold medallist Akhil Kumar, has added steel to their line-up. Akhil spoke to The Tribune from Pune about turning professional, the club versus country debate, what the WSB offers in terms of opportunities and much more. You have been the biggest addition to the Mumbai Fighters squad. Is there some added pressure on you because of that? Not at all. I looked at this as an opportunity to make the most of a big event. I have every intention of doing so. The pressure will be the same for all the boxers. But for someone as seasoned as you, won’t representing India become a problem? No. This is a misconception. The WSB, with exceptions, doesn’t stop a boxer from representing his country at the Olympics. So there is no problem there. Moreover, the franchise is known as an Indian franchise and all boxers, when they enter the ring, will be introduced by their nationality. Also, there is an Olympic berth up for grabs in every category, as the winner gets a direct entry into the Games in his weight category. No boxer can put anything above his country. So what is the WSB all about? Is it like the IPL of boxing? It is different and bigger. The IPL is a domestic tournament. Of course the idea of holding an event with franchises in India can be credited to IPL, but the concept has been there the world over. 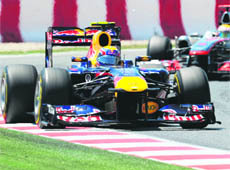 The WSB involves 12 teams from different countries. With home and away matches on offer, players will get a feel of what it is like to be a professional boxer. What is in it for Indian boxing? How does WSB add to that? The WSB is a big event. Like all big events, the major plus point is that it will generate plenty of jobs for people who are related to the sport. There will be opportunities for trainers, physios, doctors, coaches and of course the players themselves. Additionally, with the teams setting up base in one city, they will want to develop the required infrastructure and that again will provide jobs to many more people. It is a big moment for boxing and a wonderful time to be associated with the sport. Lastly, how do the National Federations benefit from the WSB? They are the ones who develop and train these boxers from the beginning. The federations are the ones providing the players and will certainly benefit from it. The WSB contract states that part of the commission for the franchise will be paid to the National federation, without any deduction. Moreover, the federations can decide which boxer to offer to the franchise. They don’t lose control over that as the selection cannot be done without the federation’s involvement. Messi led the fightback for a 2-1 away win over Colombia as Argentina fielded a world class trident in attack by bringing on Sergio Aguero to join Messi and Gonzalo Higuain for the second half. The victory lifted Argentina into second place in the standings on seven points, the same number as leaders Uruguay, who have a game in hand, but are behind on goal difference. Venezuela are third, also on seven points, after a 1-0 home win over Bolivia with Ecuador and Chile, who beat Paraguay 2-0 at home, on six. Colombia and Paraguay have four, Peru three and Bolivia one. Colombia, hosts to Argentina on a heavy Metropolitano pitch in hot and humid Barranquilla on the Caribbean coast, had the better of the first half and led 1-0 at the interval after Darlon Pabon scored with a free kick that took a deflection off Javier Mascherano. It was a lot easier for the other three qualifiers, who had established comfortable first-leg cushions with Ireland beating Estonia 5-1 on aggregate and the Czechs and Croats overcoming Montenegro and Turkey by the same 3-0 aggregate scores. While celebrations were in full swing in Dublin before the Irish had even kicked off holding a 4-0 lead from the first leg, there was everything to play for in Lisbon. Early goals by Ronaldo and Nani put the 2004 runners-up 2-0 ahead midway through the first half before Bosnia got a lifeline when Zvjezdan Misimovic converted a 41st-minute penalty. The visitors' hopes were short-lived though as Ronaldo's second goal eight minutes after the break restored Portugal's two-goal advantage and a minute later Bosnia were reduced to 10 men when Senad Lulic was sent off. Ajay Jayaram stunned world number six Sho Sasaki in the opening round of the men's singles event. Indian beat the sixth seed Japanese 14-21, 21-18, 21-14 to set up a clash with Jie Yao of Holland in the second round. Arvind Bhat and RMV Gurusaidutt also notched up contrasting wins to reach the second round. While Arvind beat Tien Chen Chou 21-18, 21-15, Gurusaidutt defeated French Brice Leverdez 21-11, 21-16. Up against four-time World Champion Lin Dan, India's P Kashyap put his heart out and was leading 1-0 before going down 21-16, 17-21, 14-21 in a one hour and seven minutes match. Rupesh Kumar and Sanave Thomas also reached the next round after beating English pair of Chris Adcock and Andrew Ellis 21-16, 21-17 in the men's double competition.